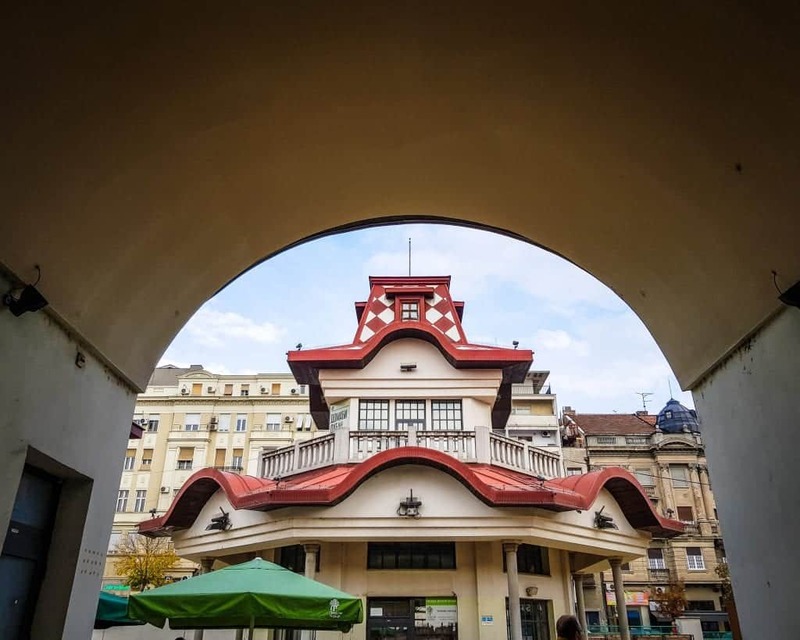 Belgrade has over thirty farmer’s markets, but the most famous is the centrally located Zeleni Venac Pijaca, or the Zeleni Venac Market. 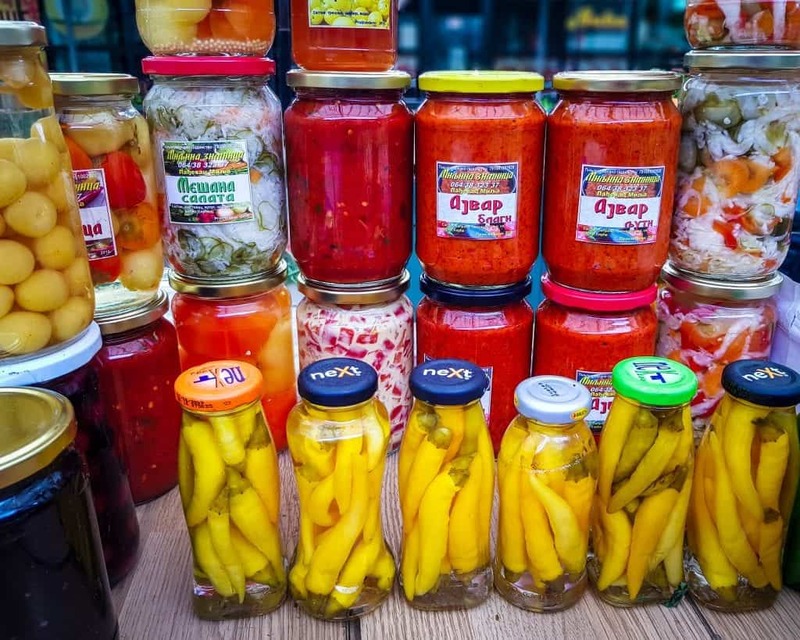 Just a quick five-minute walk from Hotel Moskva or Terazije Square, this is a great place to stop if you’re looking for fresh produce or other local Serbian foods like ajvar or Fruska Gora cheeses. 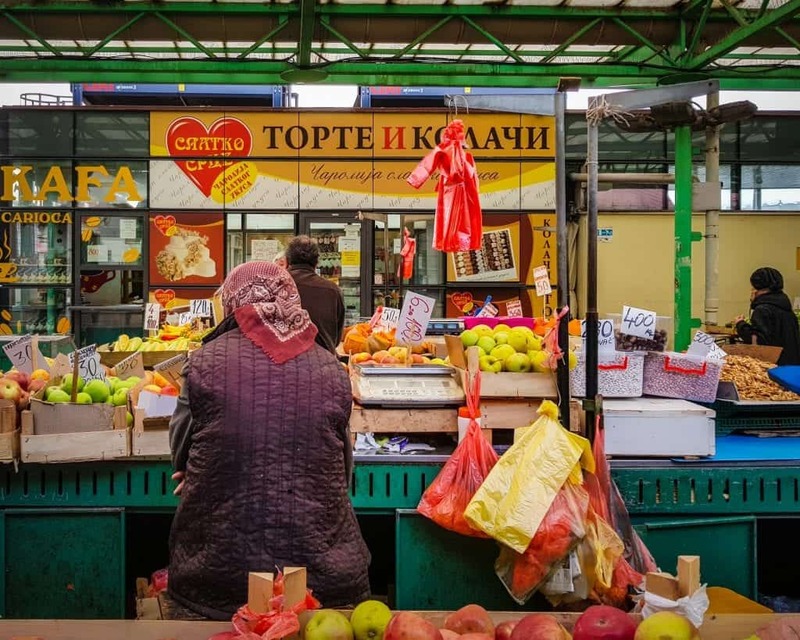 Like most Balkan cities, local markets are a common way for city residents to purchase their fruits and vegetables. 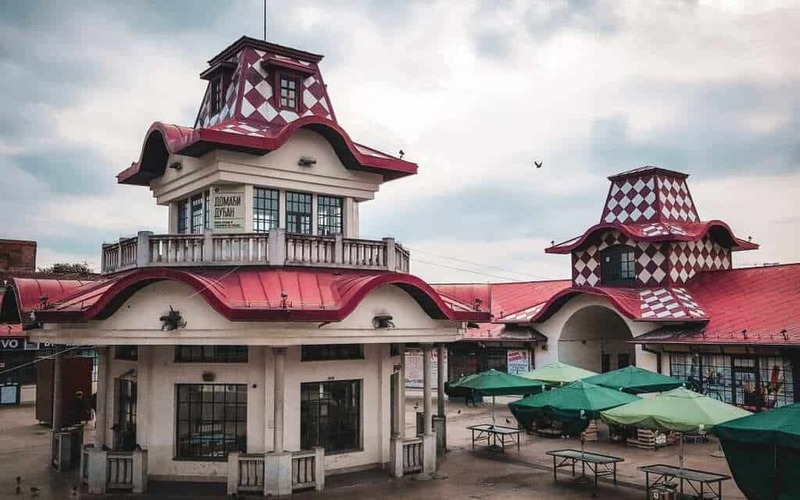 However, not all markets can boast about the unique and colorful architecture that Zeleni Venac offers visitors. 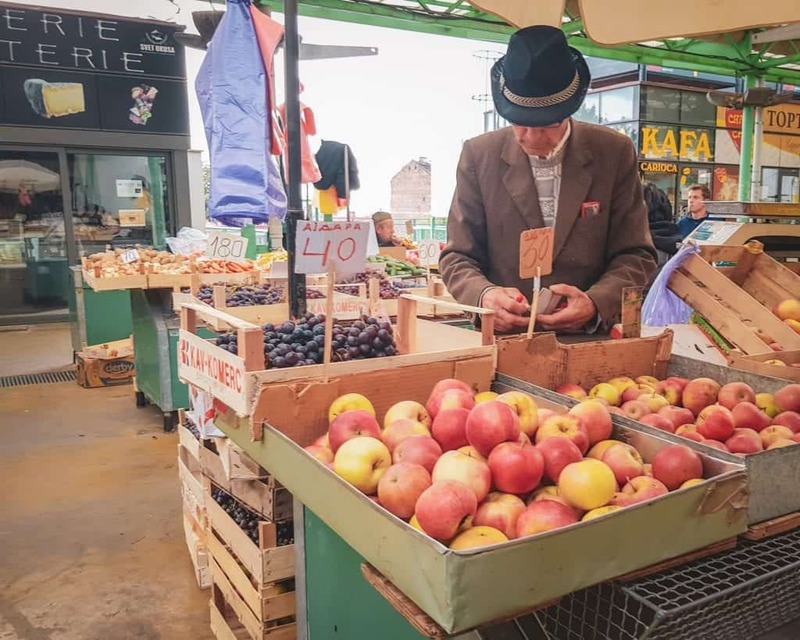 Dating back to the early 19th century, Zeleni Venac Pijaca is the oldest green market in Belgrade that is still in operation. In 2017, the market celebrated its 170th anniversary. The market’s name is the same as the name of the neighborhood. Meaning “Green Wreath,” the neighborhood was named Zeleni Venac after the wreath that a local kafana owner placed on the door of her shop. While this kafana is now a McDonald’s, the neighborhood’s market is still open. The current distinctive building was built in 1926. It was recently renovated to look like it did historically, and it is a protected cultural landmark. 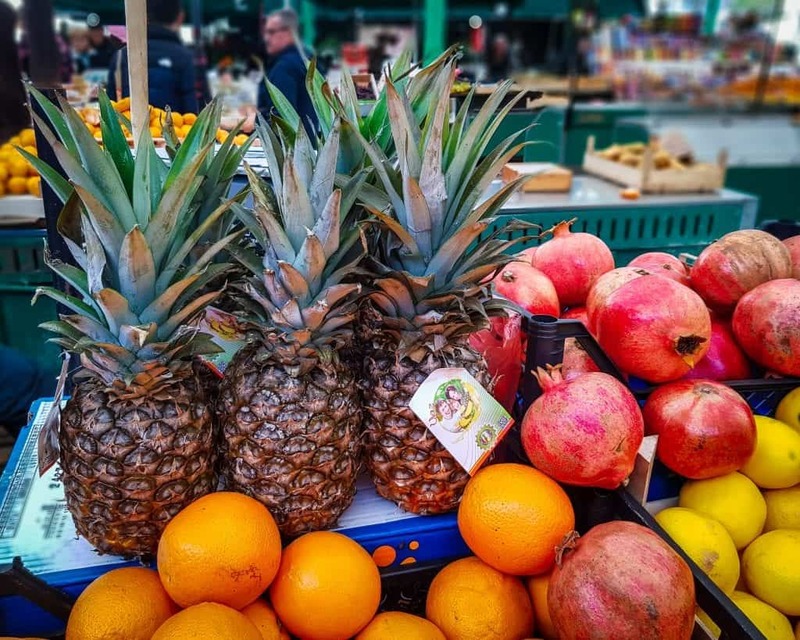 Today the market feels like a typical European farmer’s market, with aisles of fresh fruits and vegetables, jars of pickles and other homemade foods, stalls with flowers, deli and cheese stops, and a few spots for souvenirs. The market is not very touristy, so despite its central location, you will see many more locals shopping than tourists. It reminds me of Sofia’s Zhenski Pazar – a great local market that tourists seem to overlook despite great locations and interesting history. However, this means that for those that decide to visit there’s a ton of local culture to experience without having to fight other tourists for the privilege and without ruining the experience for locals. The market is centrally located and is easily accessible via public transportation. It is directly connected with BAS, which is Belgrade’s main local bus station. Thus, regardless of where you’re coming from in Belgrade, it’s connected by public transit. The market is on bus lines 15, 16, 18, 63, 71, 75, 95, and 704. 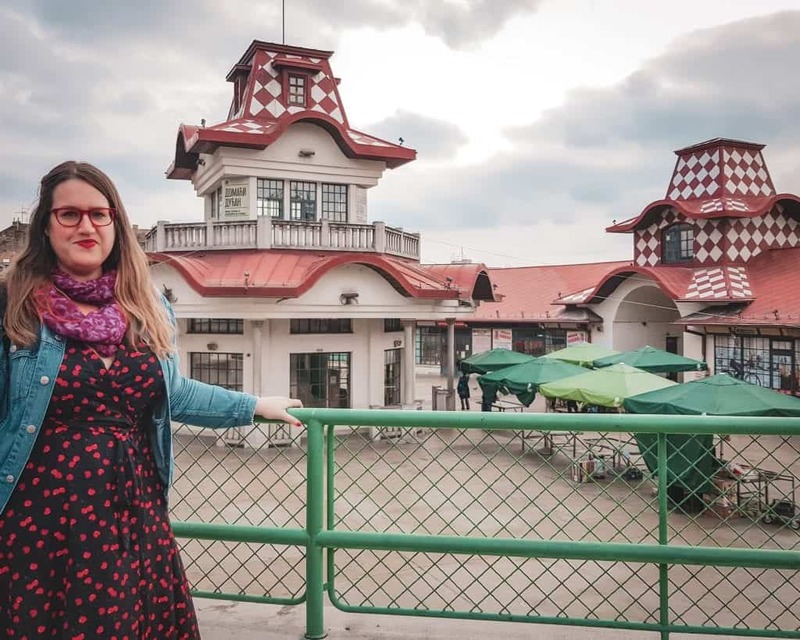 The market is also a quick walk (less than ten minutes) from most of Belgrade’s most important sites in Stari Grade (the Old City) like the Hotel Moskva, Terazije Square, Branko’s Bridge, Republic Square, Knez Mihailova Street, and Holy Archangel Michael’s Church. If you are staying outside of the city center and do not want to use public transportation, taxis in Belgrade are reasonably priced. We use the local CarGo app, which is similar to Uber. If you use a taxi app, put in “Zeleni Venac Pijasa” as the destination. For updated information about the Green Markets in Belgrade, check the official website. While I love taking photos all over Belgrade (it really is just an amazingly Instagrammable city), I think this market is a really fun place to explore and photograph. Between the funky red-and-white architecture, the people watching and opportunities for street photography, and the gorgeous produce, there’s a ton here for photographers to explore. The red-and-white building is hard to miss when you pass by, but it’s even weirder and cooler up close. This great view from inside the market was one of my favorites. I love photographing the textures of the different produce, especially when they’re lined up for display and deliciously ripe. Occasionally I’ll even buy some fruit instead of just photographing it and then getting tacos. While I wanted to gobble up the locally made candies, I restrained myself and came back with a photo instead. 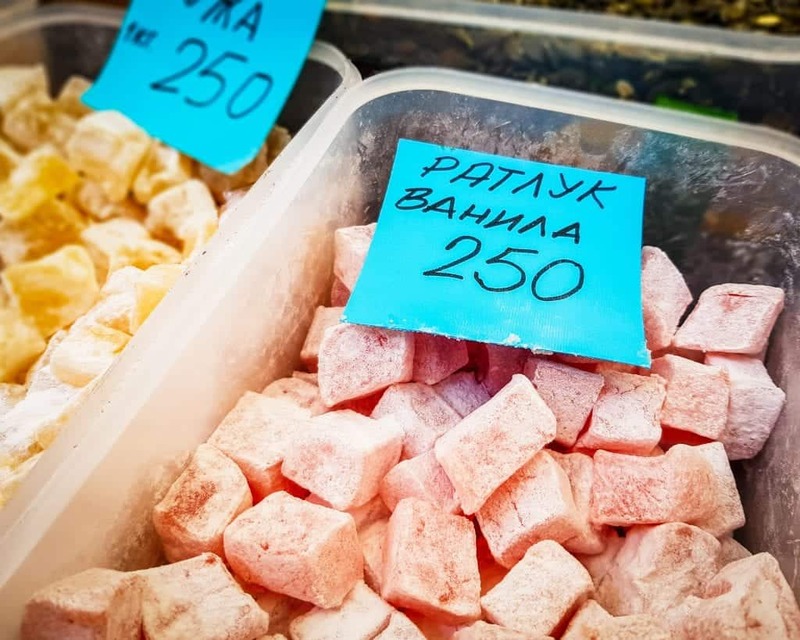 I’m still drooling over this sugar-covered ratluk (Serbia’s version of Turkish delight). I can practically taste the powdered sugar from this batch of vanilla ratluk melting on my tongue. People watching is one of the best reasons to visit the market. 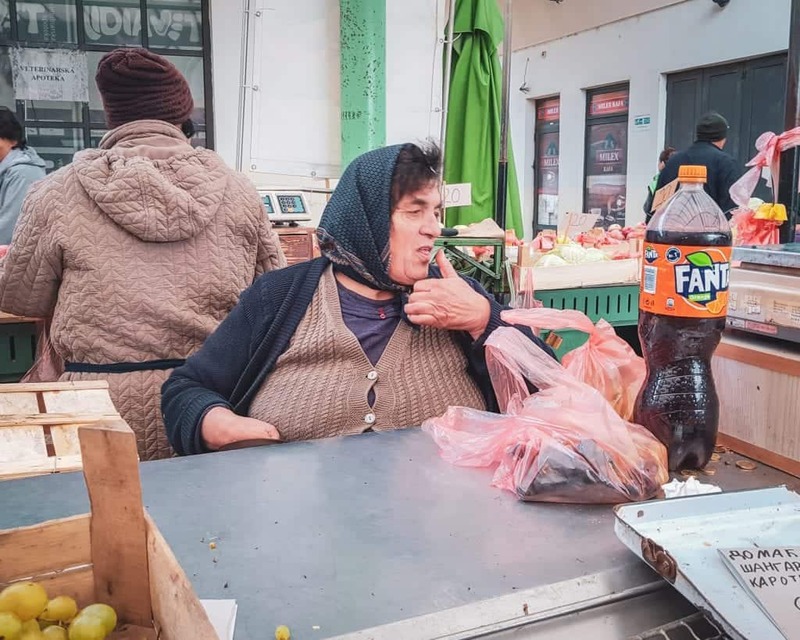 Between the men and women who work as vendors and the mix of locals and tourists coming to shop, there is always something to learn about Serbian culture here if you pay close attention. The flowers at the market are so fresh that I literally have to tone down the color saturation on the photos or they look oversaturated. 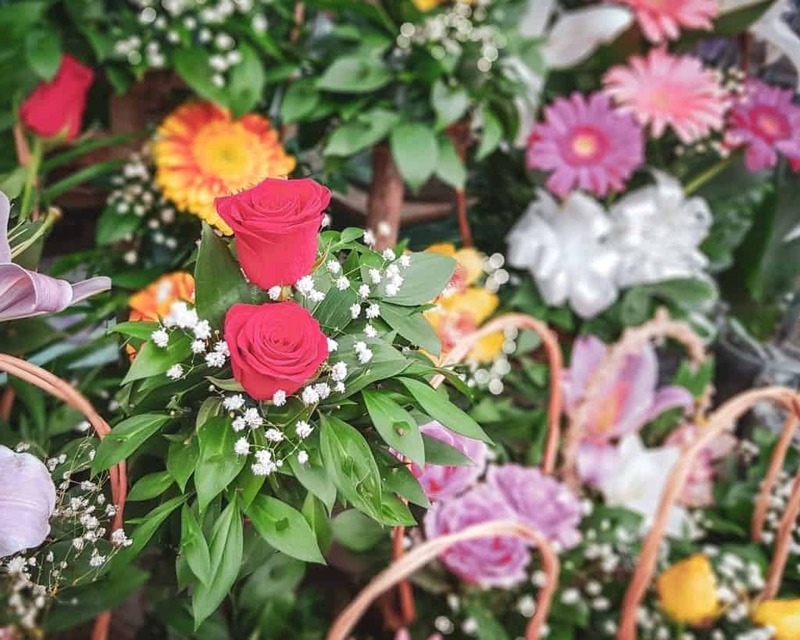 The pinks and greens of these roses were almost too much to handle. 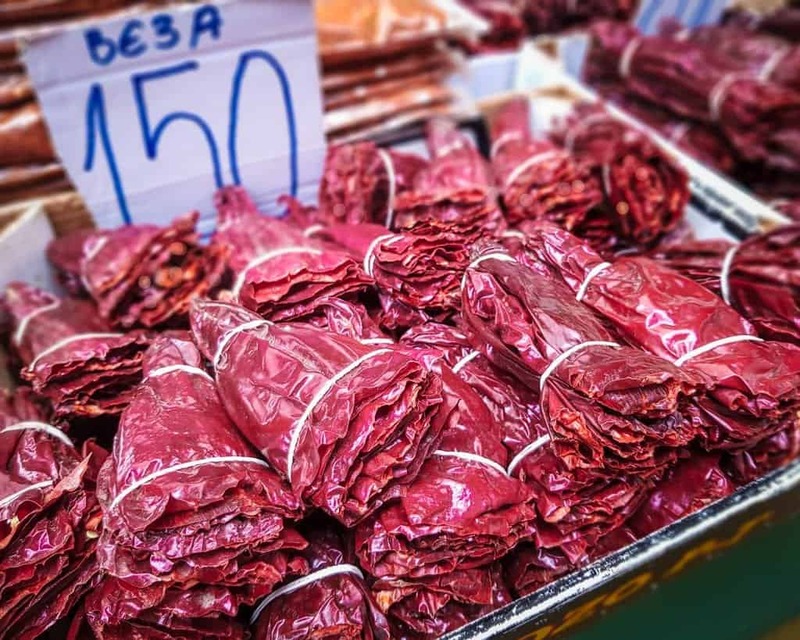 These dried peppers make a delightful souvenir from Serbia, but they last longer if you also snap a photograph before using them! Bring cash to pay for items from the vendors. The stores on the edges, like the Shop & Go, take credit cards. However, you can pay the vendors only in Serbian dinars (no Euros, etc). The market is open daily from 6 am until 7 pm. These are the same hours for every Green Market in the city. Don’t skip the fancy Charcuterie and Cheese shop, the deli, and other stalls on the edge of the market. This is not a very touristy market, so English is not widely spoken. Furthermore, virtually all of the signage is in Serbian, written with their version of the Cyrillic alphabet. We recommend downloading this handy guide to the Serbian alphabet before your trip! Luxury: We’d be remiss if we didn’t suggest the classic luxury option in Belgrade, Hotel Moskva – one of our favorite buildings in the city and a classic haunt of famous politicians, musicians, actors, and other celebrities who pass through Belgrade. It’s just a stone’s throw from Zeleni Venac and is a Belgrade institution. It’s also surprisingly affordable for its caliber! With a renowned spa, delicious restaurant (don’t miss the moskva schnit cake – we love it! ), and beautifully designed rooms, it’s one of our favorite places in Belgrade and the location is unbeatable. However, it’s almost always sold out, so be sure to check availability and book well in advance and hope you get lucky! Have You Visited Zeleni Venac Pijasa or other Belgrade Green Markets? 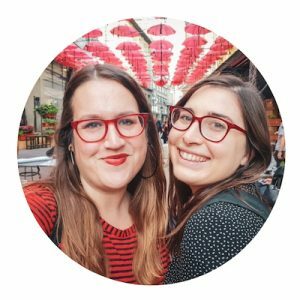 Are you researching Belgrade for an upcoming trip? Leave your best Belgrade market tips and any questions you have below!